The members and friends of Heart of Maryland Classic Chevy Club welcome you to our website. 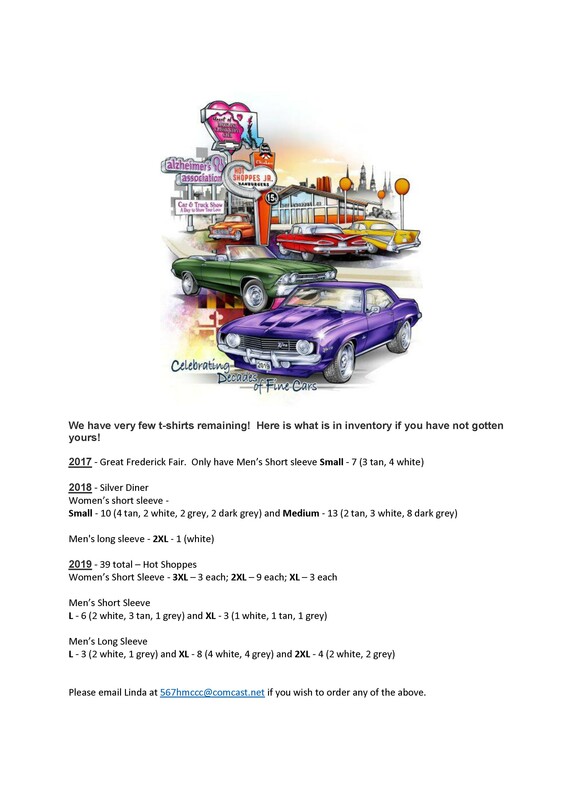 As a club, we are dedicated to the enjoyment Chevys and other classic vehicles. Heart of Maryland Classic Chevy Club is local chapter #96031 of Eckler’s Classic Chevy International of Titusville, Florida. 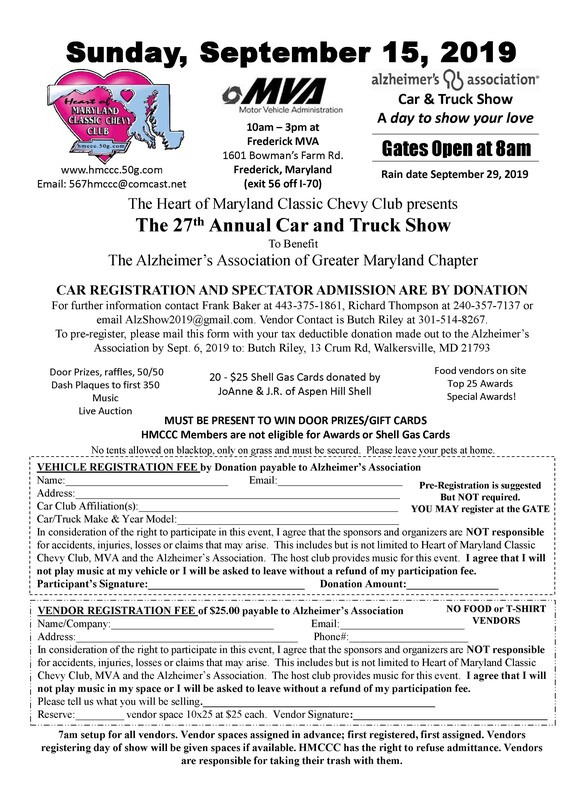 Heart of Maryland Classic Chevy Club is incorporated in the State of Maryland as a non-profit organization. 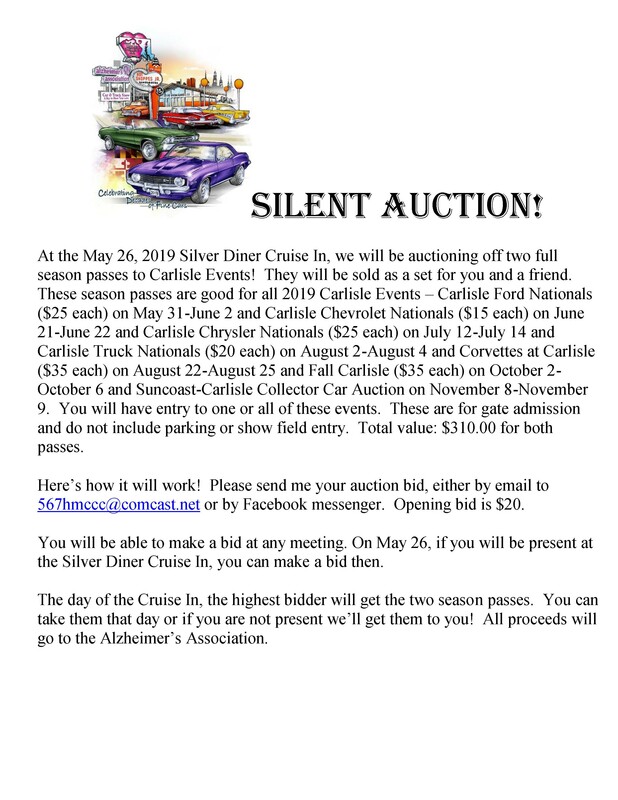 We are a family-oriented club and host several car & truck shows each year. Dues are $20.00 per year, payable in January. for a printable membership application. 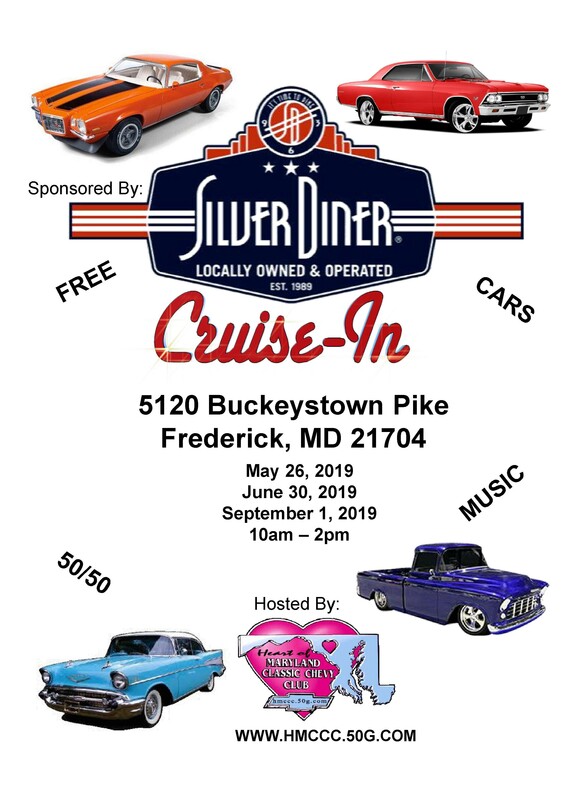 On Sunday, September 16, 2018, Heart of Maryland Classic Chevy Club hosted the 26th Annual Alzheimer’s Association Benefit Car & Truck Show at the Frederick, MD MVA. There were over 250 beautiful cars, trucks and motorcycles on display. Click here for photos of the day. 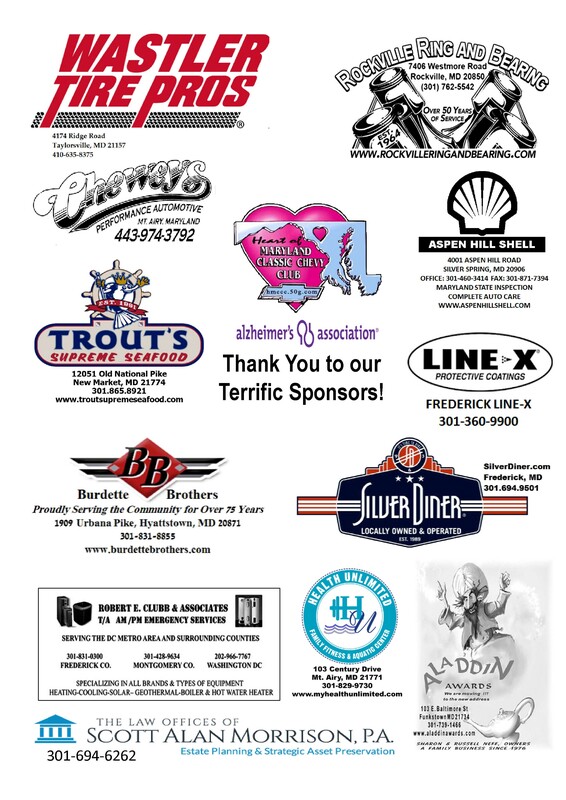 We would like to thank all the participants and sponsors who allowed us to raise $18,576.37 this year for the Alzheimer’s Association, Greater Maryland Chapter to fund projects which might otherwise need to be canceled. In 26 years, Heart of Maryland Classic Chevy Club has raised and donated over $656,830.11 for the Alzheimer’s Association. 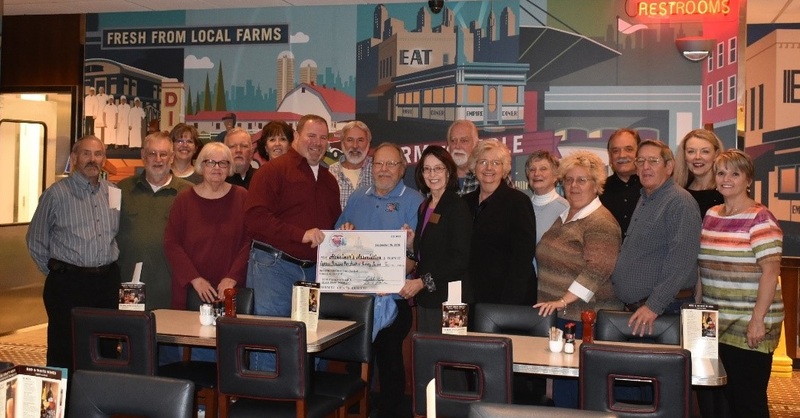 Shown at the check presentation, held on November 20 at the Silver Diner in Frederick, from left to right: front row: Butch Riley, Carroll Anderson, Elayne Anderson, Larry Davidson, Richard Thompson, Cass Naugle, Executive Director of the Alzheimer’s Association Greater Maryland Chapter, Tammy Payton, Development Assistant for the Alzheimer’s Association, Linda Riggs, Jim Riggs and Sissy Riley. 2nd Row: Carol Davidson, JR Rosenberger, Joanne Rosenberger, Paul Schneider, Mike Kefauver, Martie Kefauver, Frank Baker and Janet Stein. 7:00 pm at Calvary United Methodist Church, 403 South Main Street, Mount Airy, MD 21771. There is plenty of parking behind the church (off Paradise Ave). The meeting room is in the basement. 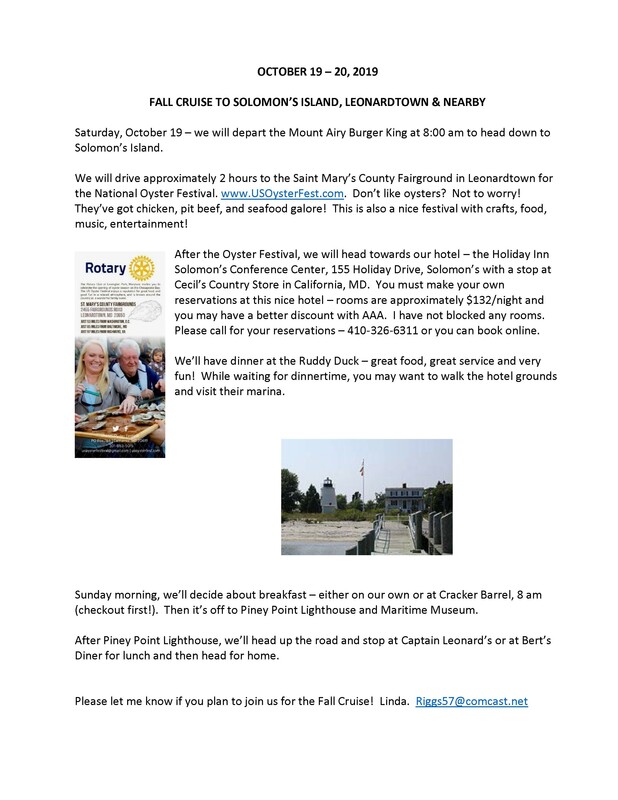 18 May - Spring Cruise to Gettysburg Pa.